Google AdSense has introduced click-to-play video ads format to the AdSense website publishers and AdWords advertisers, where instead of usual text and image ads, a video will be shown to the viewers where they can click on the Play button to view the video ads clip. However, AdWords video ads are hard to be seen on publishers’ sites that implement Google AdSense program, may be because video ads are still new and not easy or cheap to be produced by AdWords advertisers. So when I browsed a website on the Internet, I able to watch for the first time a valid Google AdSense video ad. 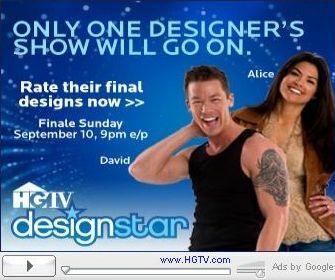 The video ad is about HGTV DesignStar Finale where the ad urged viewer to rate the participants’ final designs. So I guess the video ad will expire soon, as the DesignStar finale is on 10th Sept! The video ad is very much like a video served by Google Video, except that you can’t resize the video, and the video control buttons on full screen and resizing has been replaced by Ads by Google caption. The duration and current timing of the video has also been replaced by advertiser’s website URL. Mind you, the video ad about HGTV DesignStar is not short, it’s about 1 minutes and 45 seconds long. Beside, when you click on the video during the play, you will be directed to advertiser’s site too, instead of nothing happen in Google Video. Here are some screenshots and captures. The initial image of the AdSense video ad. During the play of the video ad. If you mouse over the video, the advertiser’s URL will be shown. At the end of the video ad, viewers are shown advertiser’s site only with the hope that they will click to visit.